The Woman in Black tells the story of a solicitor, sent to a far provincial town to put to order the paperwork of a recently diseased, and his brushes with the titular character. And while, in essence, the play is about the same thing as the novel (and the many film adaptations)–it’s also a different entity all together. Mostly because the stage play of The Woman in Black takes the setting from the small English town to a theater stage–literally. In the stage play, after surviving the horrors of the woman in black, Arthur Kipps sees a man to help him tell his tale. Except, the man misunderstands and sets about in staging the unusual horror story that Arthur Kipps has brought. Constantly chastised, Arthur decides to go along with the reenactment of his experiences in the small town; and through various set pieces, manages to recreate the horrors of meeting the woman in black. And they do manage to recreate the horrors. On stage. I’ve seen the most recent film adaptation, which tackles the story a little different from the novel too, so I already kinda knew what was going to happen. But seeing as the stage play isn’t exactly like the novel either, I knew there was bound to be different twists as well. What I was really looking forward though is to see how Dulaang Kalay, the theater group behind this local production, would go about doing the scares. The crown goes to the lighting director (and staff)–and really fast stage hands. Those two, plus Teatrino’s unique theater layout, made the production live up to the title’s promise of horror. As for the actors, Jeremy Domingo was wonderful as the real Arthur Kipps–and the host of other characters he had to play, with different accents to boot. But as for Reb Atadero… While manages the swagger of his character well, and the vulnerability of Arthur Kipps during the reenactments, there were times when it was hard to understand what he was saying. His British accent was, for the most part, unnatural. It was all the more noticeable because his co-actor, Domingo, was doing exceptionally well in the accents department. And you can’t exactly say that British accents are harder to understand–because as a theater actor, it’s your duty to make sure the audience understands your every word. In the end though, what matters is that the production was able to give its promise of horror. Though, I think I like the film adaptation better for it’s clearer explanation of what happened to the woman in black, and its attempt at explaining why it sought revenge against Arthur Kipps–who shouldn’t have been part of the curse–as well. a friend of mine is selling tickets to a local production of THE WEDDING SINGER musical, and i thought i’d help out by posting about it here. i liked the movie (starring adam sandler and drew barrymore) that spawned the musical, but i have no idea what goes on in the musical: what they kept, what they changed, and what they added. and since previous musicals i’ve watched live are musicals i’m already familiar with, i’m coming in cold with this one. 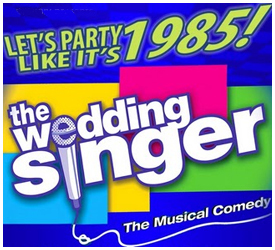 the 9 works theatrical production of THE WEDDING SINGER opens october 23, and ends its run on november 17. my friend is selling tickets for the november 7 show. for more information about the local production, check out this blog post from gibbs cadiz. and i’ll post my thoughts on the musical after watching it on november 7. i do hope it’s better than their production of RENT, which was okay but was cringe-worthy during some parts.